I must admit that I haven't been paying too much attention to my bodily hairs since my boyfriend and I started seeing each other. I guess I'd make a great cave woman. I am so glad that Nad's came out with a cream hair removal product with a little in built compartment to store the sponge, I am notorious for losing sponges! The application was simple, I spread the product all over my legs and waited 4 minutes (significantly shorter than previous hair removal products where I had to wait 10-15 minutes) and rinsed it off in the shower, my legs were silky smooth! This is perfect for sensitive skin, no stings, no rashes, no burning sensation and all hairs came off with ease. When it comes to hair removal, I've always been a shaver, my friend waxed my legs in high school and bruised it, I never allowed wax on to my skin that day forward. 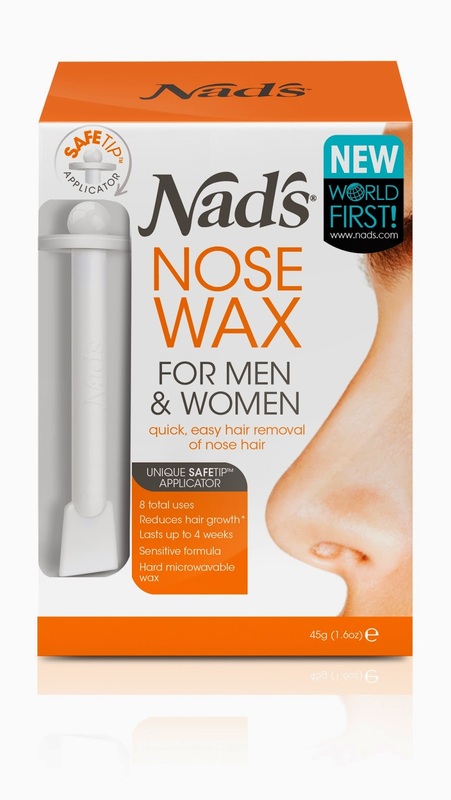 My boyfriend on the other hand was optimistically keen to try out Nad's nose wax. This is the most organised kit I've ever seen. I wasn't sure what the moustache stickers were for when I first saw them. Boyfriend thought it might be an element of amusement to counteract the pain factor from pulling out your nose hair. Oh but we were wrong! It's obviously a prop for silly selfies! 5. Count to 90 and pull it out! This is a 2in1 nose wax kit. You can wax your nose and clean your pores! 2. Count to 30 and gently remove the wax, it doesn't hurt. Remember how I said I haven't had wax on my skin since high school? Well, that's changed now, my role as a bystander was unbearable, I HAD to trial this out. I wasn't brave enough for the nose wax but we had a lot much fun with this wax and decided to rid other facial hairs... i.e., boyfriend's monobrow and my upper lid fluff. It did a great job by the way, we are both sold, boyfriend requested to keep the kit at his place. We gave each other the nod of approval. Check the video below to see the nose wax in action WARNING - nose hairs were pulled in this video. The nose wax might just be the perfect gift for hairy dads since Father's Day is just around the corner. Are you a shaver, waxer, laser hair remover, cream user or other? Ah it's that time of the month again! I can't believe August is almost over, Christmas is just around the corner. August is LHI's birthday month (and mine too!) I had high expectations for this month's content. Apparently this product will assist in reducing the appearance of stretch marks and improve your skin texture. Personally, I am extremely skeptical when it comes to products that will "diminish" anything from your skin. I believe skincare can assist in reducing and preventing x y and z. A nice, big full sized product but I don't think this product is for me. Mum might like this! As much as I love Wotnot, it's a nice change to see wipes from a different brand in LHI packs. The product claims to remove waterproof products - I haven't had much luck with removing waterproof mascara with wipes. My lash casualties saddens me, I just cannot bare to use it on my lashes anymore. On the contrary, I'm optimistic to try this on my face. This is an all in one miracle treatment, it'll control frizz and flyaways, add shine, smooth, soften and strengthens. I usually quite "meh" about hair products, but I have a lot of flyaways. I hope it works! Bioderma has made quite a few appearances in LHI packs/boxes. I use micellar water on a regular basis - especially when I'm using a crappy cleanser. I don't mind receiving another one of these. Oh and I received a lot of vouchers, most will go unused. What did you think about this month's pack? I remember doing this on Youtube years ago. I love a sneaky beak and seeing what other people carry in their bag, I guess it's a way for me to normalise the fact that I carry a lot of unnecessary items in my bag. There's a reason why I can never find anything in my bag...LOOK AT ALL THIS JUNK! Here I have my two phones, wallet and and coin purse. I always carry an umbrella in my bag, you never know when it'll rain. The Moxie tin for all my lady products, Extra gum to keep the bad breath away. I am currently reading One Flew Over the Cuckoo's Nest, it's about a psychiatric institution - quite interesting. A work pass and a hair scrunchie. My bottle goes wherever I go, I started chucking jasmine tea bags into my bottles each day for flavoured tea. Headphones to keep me company. Keys, a pen or two and some strepsils. I have absolutely no idea why I have so many lip products in my bag! I took my boyfriend to Kobe Jones for his birthday a couple of weeks ago. Kobe Jones made an impression with their scallops at a Taste of Sydney. So I thought... perfect I'll take him there for a degustation. This is my second time at Kobe Jones, click here to see the first time. I fell in love with Sake during my most recent trip to Japan.. especially warm sake during winter. This sake was a bit watered down compared to the ones I had in Tokyo. This was amazing, so much flavour and texture! I need to find out what their "secret sauce" is!! Rather average to be honest, not much flavour... vinaigrette dressing more or less. Again... another average dish, the sashimi cubes were quite fresh but where is the flavour!? This was really disappointing, the flame grilled sashimi from my local sushi train tastes better.. I thought this was FISH!? very odd tasting calamari, it was nice though. This was nice, can't really go wrong with deep fried goods ..
A part from the fact that the sushi was more or less mush, the flavour was there. Disappointing again, the volcano roll was much better last time. My stomach was about to burst at this point and since boyfriend doesn't eat meat, I had a lot of trouble finishing this on my own. I don't know how I felt about this, it tastes better than steaks I get at random pubs, but it wasn't as tender as some of the other wagyu I've had. Customer service was excellent, we were attended to very quickly, the food came out in a timely manner. Food ... a real let down. I purchased the voucher from Scoopon, thank goodness I didn't pay full price. I don't think I will go back there again, I've had better Japanese food from Ippudo. Would you pay $330 for this meal?